For Halloween evening, my husband and I went to see a Halloween themed burlesque show at Gallery 5, that a few friends were putting on. 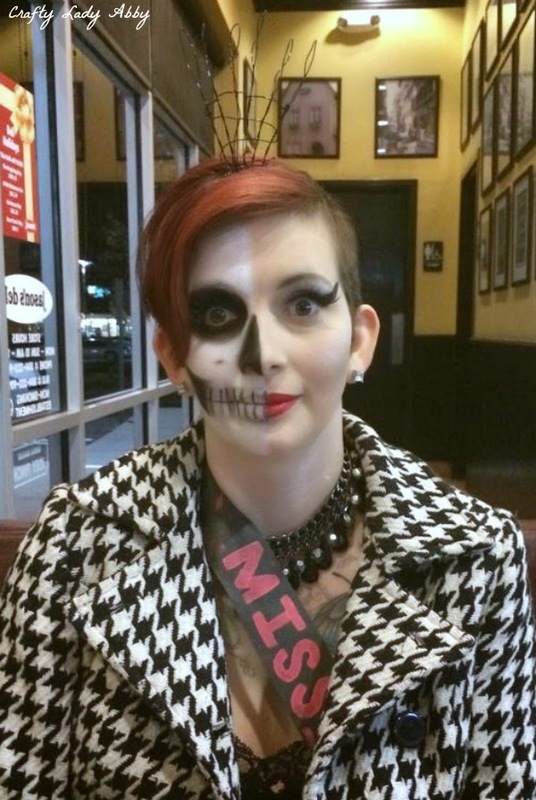 I needed a last minute costume and wanted to incorporate skull makeup. 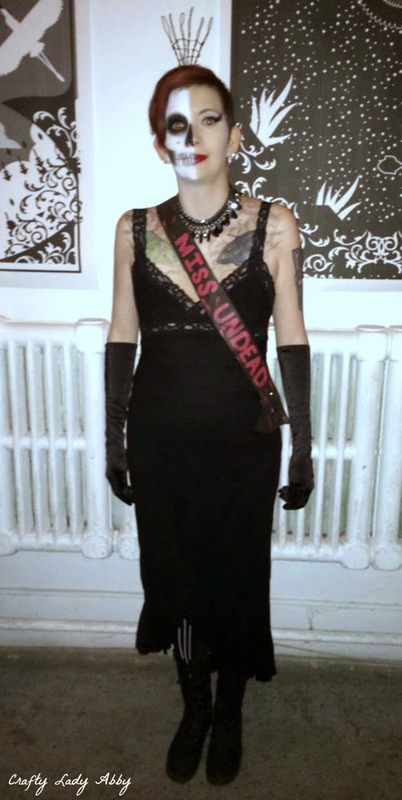 I chose to go as "Miss Undead", a deceased beauty pageant winner. 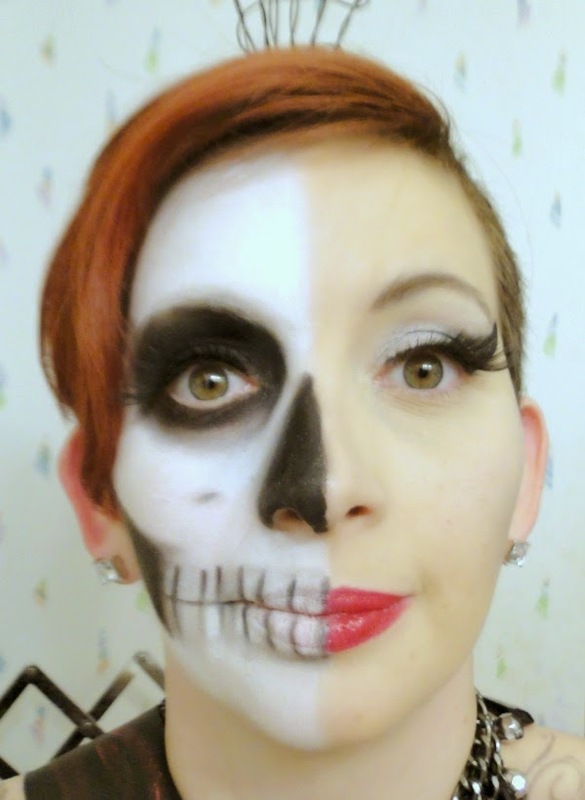 I quickly threw together a half skull and beauty makeup. I've been doing more dramatic beauty makeup, on the rare occasion I wear makeup, so the beauty side reflects that in a toned down version. I kept the skull basic and somewhat anatomically correct (the cheek hollow is too big, but that's hindsight). 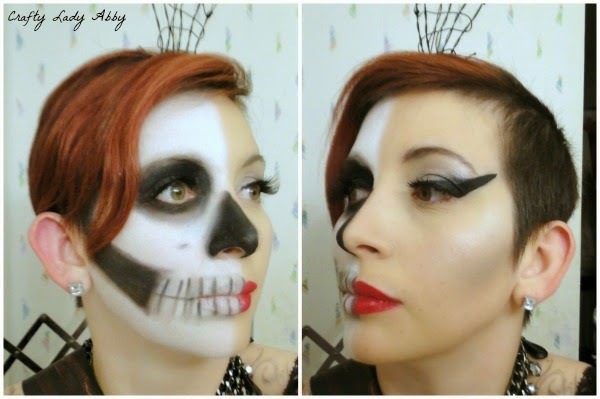 For the skull, I used Ben Nye's white creme makeup applied with a foundation brush (I have two...one for white and one for normal foundation). Over that, I used a Death White powder. For the black areas, I used a black Rimmel shadow eyes stick, Sugarpill eyeshadow in Bulletproof, and a dark grey Jane eyeshadow. 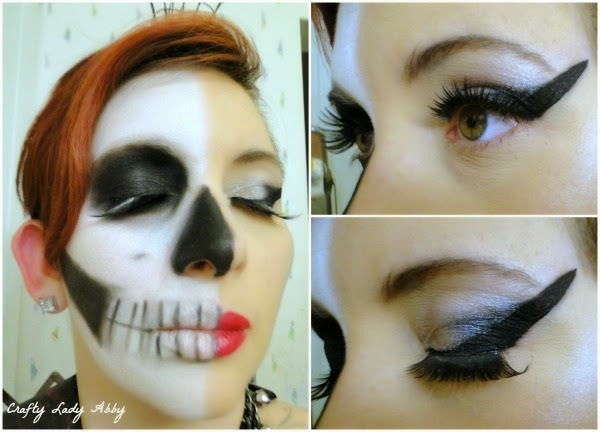 For the teeth, I used the same black and grey eyeshadows. I used different eyeshadow brushes to blend the edges. I was rushing, so it's not as blended as I would have liked. For the beauty side, I used Studio Effect foundation in bisque (I need a paler shade), Shiseido's creme concealer in their palest shade (still not light enough), and Clinique translucent powder in their palest shade. I used the grey Jane eyeshadow for a contour and Maybelline champagne eyeshadow for a highlight. For my eyes, I used the Rimmel black shadow eyes stick, Sugarpill Bulletproof, a silver Jane eyeshadow, and a Rimmel black liquid eyeliner. My lips are a random red lipstick...an old Wet N Wild color. I have on false eyelashes that I bought post-Halloween a couple years back. A look at my mouth. A look at my eyes. Miss Undead needs a tiara of course! 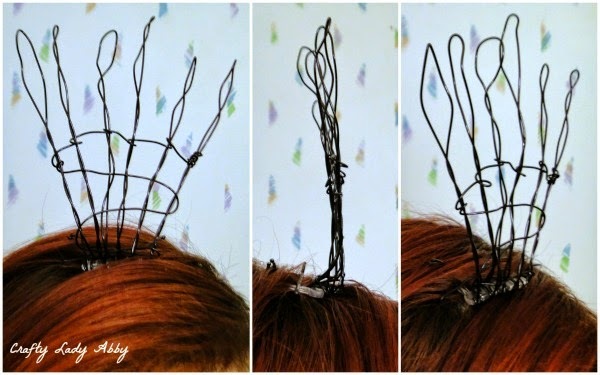 I used a clear hair comb and black wire to make this. I used bobby pins to help hold it in place on my head. My husband took this photo of me at dinner. This is my full costume at Gallery 5. That's all for my Halloween costume. My husband wasn't able to dress up, due to time conflicts. However, you can see our daughter's Weeping Angel Costume here. Hope everyone had a Happy Halloween!